Right now, 400km above the Earth aboard the International Space Station, are two very special Raspberry Pi computers. They were launched into space on 6 December 2015 and are, most assuredly, the farthest-travelled Raspberry Pi computers in existence. Each year they run experiments that school students create in the European Astro Pi Challenge. Left: Astro Pi Vis (Ed); right: Astro Pi IR (Izzy). Image credit: ESA. Today marks the tenth anniversary of the launch of the European Columbus module. The Columbus module is the European Space Agency’s largest single contribution to the ISS, and it supports research in many scientific disciplines, from astrobiology and solar science to metallurgy and psychology. More than 225 experiments have been carried out inside it during the past decade. It’s also home to our Astro Pi computers. Here’s a video from 7 February 2008, when Space Shuttle Atlantis went skywards carrying the Columbus module in its cargo bay. Today, coincidentally, is also the deadline for the European Astro Pi Challenge: Mission Space Lab. Participating teams have until midnight tonight to submit their experiments. At 16:30 GMT today there will be a live event on NASA TV for the Columbus module anniversary with NASA flight engineers Joe Acaba and Mark Vande Hei. 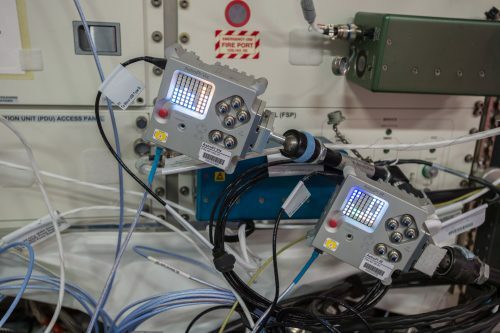 Our Astro Pi computers will be joining in the celebrations by displaying a digital birthday candle that the crew can blow out. It works by detecting an increase in humidity when someone blows on it. The video below demonstrates the concept. Uploaded by Effi Edmonton on 2018-01-17. The exact Astro Pi code that will run on the ISS today is available for you to download and run on your own Raspberry Pi and Sense HAT. You’ll notice that the program includes code to make it stop automatically when the date changes to 8 February. This is just to save time for the ground control team. When you see a blank blue screen with the brightness increasing, the Sense HAT is measuring the baseline humidity. It does this every 15 minutes so it can recalibrate to take account of natural changes in background humidity. A humidity increase of 2% is needed to blow out the candle, so if the background humidity changes by more than 2% in 15 minutes, it’s possible to get a false positive. Press Ctrl + C to quit. Please tweet pictures of your candles to @astro_pi – we might share yours! And if we’re lucky, we might catch a glimpse of the candle on the ISS during the NASA TV event at 16:30 GMT today. Big Birthday Weekend 2018: find a Jam near you! Announcing the 2017-18 European Astro Pi challenge! Mission accomplished for the European Astro Pi challenge! You've been asking for it for almost a year now! Create your own fun and frantic version of the classic game Snake on a Sense HAT.